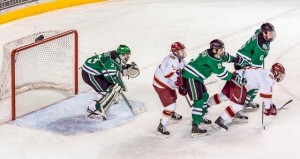 This Thursday, the University of North Dakota Fighting Hawks will take on the Denver Pioneers in the semifinals of the NCAA’s Frozen Four. This will be the sixth time the two teams have played this season. The winner will advance to the championship game of the Frozen Four. Loser goes home. The Fighting Hawks have seen this act before, they’re making their third straight Frozen Four appearance. This will also be UND’s eighth visit to the Frozen Four in the last 12 years. During that time, UND has a 1-9 (.111) record in the Frozen Four. They’ve only been able to win one semifinal game. Since the 2004-05 season, UND’s has been one of the most successful teams in Division I hockey. 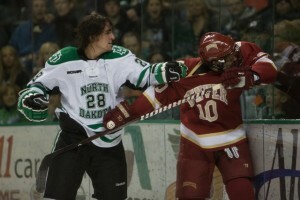 UND’s NCAA tournament record of 19-11 (.633) is second only to Boston College 23-8 (.741). During that time, the only thing to evade UND has been an NCAA title. It’s been 16 years since UND last won a national title and Fighting Hawks Nation is getting antsy. Reading the fan message boards and Twitter, I can conclude that UND fans are tired of watching UND make it to the Frozen Four only to lose in the semifinals. After watching the Hawks roll over Northeastern 6-2 and Michigan 5-2 two weeks ago, confidence is high that this could be the year that UND finally breaks through and wins that elusive eighth national title. The players know what’s at stake. North Dakota Fighting Hawks: Forwards: Brock Boeser (26g-28a—54pts), Drake Caggiula (21g-25a—46 pts), Nick Schmaltz (10g-34a—44pts), Austin Poganski (9g-15a—24pts), Luke Johnson (11g-10a—21pts), Rhett Gardner (10g-6a—16pts). Defense: Troy Stetcher (8g-20a—28pts), Tucker Poolman (5g-19a—24pts), Paul LaDue (5g-13a—18pts). Goaltenders: Cam Johnson (22-4-2, 1.67 GAA, .934 save percentage), Matt Hrynkiw (10-2-2, 2.13 GAA, .910 save percentage). Denver Pioneers: Forwards: Danton Heinen (20g-28a—48pts), Dylan Gambrell (17g-30a—47pts), Trevor Moore (11g-33a-44pts), Quentin Shore (13g-15a—28pts). Defense: Will Butcher (8g-23a—31pts), Nolan Zajac (3g-17a—20pts), Blake Hillman (3g-7a—10pts). Goalies: Evan Cowley (8-5-1, 2.07 GAA, .929 save percentage) Tanner Jaillet (17-4—5, 2.25 GAA, .923 save percentage). Fighting Hawks head coach Brad Berry on playing the Pioneers. Pioneers head coach Jim Montgomery on playing the Fighting Hawks.